Panettone Balsamico for sale. Buy online at Zingerman's Mail Order. Gourmet Gifts. Food Gifts. At first I thought this was a gimmick since, for the last decade, it's seems like Italians have been trying to inject balsamic vinegar into every food in sight. Turns out this invasion is an excellent innovation. And it kind of makes sense since cooked grape must—the base of balsamic vinegar—was traditionally a sweetner in Italy. That's how it's employed here. The balsamic is laced through the cake, forming a ribbon of sweet, dark glaze. Instead of finding panettone's usual gems of candied fruit, you'll discover veins of cherry-sweet, luscious caramelized balsamic. If you're a panettone beginner—or traditionalist—this probably isn't the cake for you. Go for the classic panettone. But if you're looking to expand someone's horizons this makes a great gift. 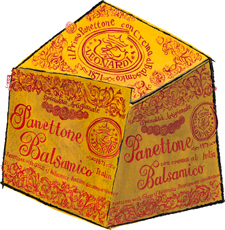 Like with all panettoni the packaging is stunning. "The best new thing I've tried in a long time."